End Loaded - Made for power hitters, this Z4000 has an End Load weighting for more mass at the end of the barrel. Pros: This bat is serious. Put about 150 swings on it in the cage so wasn't real sure about distance until today. Sent a few with the first dozen I hit. The best thing about this bat is it is extremely forgiving. Great pop even when you don't hit the sweet spot. When you do expect a bomb. I was very surprised with the distance on a few considering i felt next to nothing on contact. 3 piece construction is legit. All around solid. I was hoping I would like the 4000 as much as the 2000. Well, I do. Cons: Nope. Hope the 3 piece construction holds up. Pros: Bat has amazing pop out of the wrapper. I hit moon shots with this bat, and love how it feels. The end load is perfect for guys who like to hit home runs. Cons: Within 30 swings and less than 20 days of owning this bat, it blew up. I hit a softball in a tournament, and the entire barrel cracked and pieces went everywhere. Not sure if anyone else has had this happen. Hopefully this is not a common occurrence because like I said I really enjoy the pop this bat has and the drive the ball has coming off this bat. Pros: Hottest bat out of wrapper by far!!! Great grip no need for batting gloves. Spin off the bat is incredible. Giving outfielders a hard time judging the ball. Cons: Broke about 5 games into my season. Louisville replaced the bat with the newer model Z-4 immediately which was nice. hopefully the new version holds up! Pros: Nice sweet spot. Ball screams off the bat. Pros: Great bat! Once this is broken in, it launches line drives like crazy. My buddy bought this bat last summer. This is his only bat of choice. It is very durable and can be used in all types of weather. Doesn't matter If you are a base hitter only or if you are the power home run hitter of the team, it works for anyone! Fair price as well. My buddy went 11 for 12 in his playoffs with this bat. Must buy. Cons: Takes a little to break in. Some people say(which I agree with) It has like movement in the handle or like a slight "twist" That's how these bats are. I have used other Z-type bats that do the same. It is at least a 2 piece bat. It is very mild you just have to get use to it. Pros: Awesome bat! There is a little bit of a break in period (about 50 swings) but once this thing opens up they are hard shots and line drives! Sweet spot is also great and even if you make contact out of the sweet spot it is still forgiving. Hands down awesome bat and would def recommend! Pros: This bat feels good and has big pop. The ball screams off the bat like no other. Love the extra grip on the lower end. No complaints and highly recommend after the bat is broken in. Cons: Takes a bit to break in but once broken in, its on fire. Pros: Nice grip. Textured bat new for 2016 for maximum performance. Pros: Really like the textured barrel, and the tapered handle grip!!!! Great feeling bat. Cons: It did take about 250-300 cuts before it starting getting hot. Wasn't terrible out of the wrapper but now its really starting to open up. Pros: Best bat I've ever swung. Before buying this bat, our whole team only had 1 Homerun all together. The first game we hit 4 as a team, and the 2nd game we hit 9. I've lost count after our 4th or fifth game, but highly suggested. Cons: only con i have is I bought this bat when it was $300. but totally worth it. Pros: Unwrapped it at a tourney. 1st swing BOMB on a mushball. Most of everyone on the team started to use it. It only got hotter throughout the day. Ordered a 26oz, feels alot lighter. Feels good in hand. Nice solid bat all the way from knob to end cap. Everyone loved the feel. The matte/sandpaper feel to it. Cons: No real cons other than the fat end knob thing. But I'll live. Pros: I previous owned z2000 and loved it. So I thought i give the z4000 a try and it was amazing out of the wrapper. Exit speed balls was coming off the bat was amazing defently loved this bat!! Cons: First time using a 30 oz, a little getting use to. Pros: I purchased the 30 oz version of this bat and it is HEAVY. Feels great though. Guys on our team hit exclusively with this bat now (versus a Z-2000 27 oz they used to hit with). Have hit several balls where I though "I didn't get all of that." only to watch it sail over the fence. Big picture, great bat. Cons: This bat is great but the end loading does make it feel heavy, and if you're a smaller person, definitely get the 27 or 28 oz version. Pros: Great bat. Hot right out of the wrapper. Laser line drives and deep bombs. Only have about 50 swings on it so I'm excited to see how it improves. Cons: Tape was fully sealed at top of grip wrap. Not a big deal as that can easily be addressed. Pros: Just got the 28oz Z4000 endload recently, doesn't feel like you swinging and 28oz bat, feels lighter. Still think I need to put a few more swings on it to get it hot. If you liked the Z3000, your probably going to this model as well. Pros: The bat has a very good feel. Not too much end load, not too little. Cons: I don't like the ultra thin handle, but I fix that by applying one more wrap. Pros: This bat feels great out of the wrapper and is only to continue to get hotter! Cons: Only negative is the grip is really thick right above the knob. This is an easy fix with new grip though. Pros: Amazing bat just got it in today. And it was nothing but long balls from the start! Cons: Just wish they had a 30 oz when I purchased it but the 26 oz will do! Pros: So far it's good! Still trying to get it all broke in! I bought it cause a guy on one of my teams I'm on had it and was swinging it! Very hot bat when it's broke in though! Cons: None as of now! Pros: Great bat, very little vibration, good pop out of the wrapper. A solid bat all around. Pros: Bomb thrower straight from open! I was hitting homeruns right from the get go. no break in time at all. If it does have break in time Im really scared for peoples cars when it gets there! Above expectations, good price and awesome look. I really love the grip tape feel of the barrel. Pros: Good pop right out of the wrapper. I have this in 30 and now 26 and have no issues. The bat is reliable and the explosion off the bat is nice. There is almost no vibration or sting when hitting. Cons: The bat chips easily. Pros: Love the tapered handle, great pop off the bat right out of the wrapper. Pros: Bar has really good pop. Took about 50 cuts to get it broken in. Used it for a couple games now and the entire team is impressed. Pros: Rocket launcher, this thing is nasty once it gets broken it. My buddy had this bat before I bought it and he went 11 for 12 in his tournament with it. It works great in cold weather and hits the ball HARD. Great for contact hitters. Cons: Both bats I have broken in (my buddies 28oz and my 26oz) took awhile to break in. Yours may not though. Pros: This bat was hot out of the wrapper. My first five swings were all long balls. Even people who normally don't hit with power were hitting to the fence. Smooth feel off the bat with a forgiving sweet spot. Cons: None that I can see at this point. Cons: To be honest I don't really have anything bad to say about the Z4 el. It's made me a life time fan of Louisville. Cons: Grip tape is loose on end of knob. The end load feel makes it feel way heavier than it is. 6 of 26 found this review helpful. Thus bat says 26oz. Is that the starting weight before the endload? What is the final weight? The "end load" does not add weight, as that's just the weight distribution. The bat is 26oz without the end cap, bat grip, and knob put on the bat. Does this bat come in wrapper with warranty? This bat is brand new unused in the wrapper with a one year manufacturer's warranty. Every bat we sell is new in wrapper unless clearly stated otherwise. Unfortunately we do not ship outside of the 50 states in America. We cannot processes international orders. All credit cards and Paypal accounts used must be issued in America and registered to an American shipping address. With the price of $149.99, does this mean the bat is unwrapped or new wrapped? This bat is new in the wrapper with a one year manufacturer's warranty. Louisville Slugger shows that they have the same bat here as well as the ASA model. Not sure what you are looking at, but if you contact us Monday-Friday 8AM-4PM at 1-800-589-4487 we can better assist you. 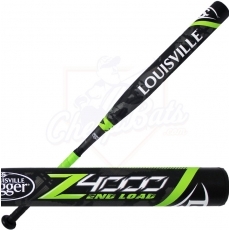 Is this equivalent to the Louisville Slugger Z-2000 End Load Slow Pitch Softball Bat: SBZ214-UE? Or a newer version? The Z2000's and Z4000's will have similar barrels but different connection pieces thus making the Z4000 have a little more flex to it. The Super Z will be the new updated version of the Z2000. Is this the dual stamp bat? I see USSSA on it, but some reviews with a bat that looked like this said it was dual USSSA/ASA stamped. I assume that means the bat is not as hot with the ASA limitation as a true USSSA bat would be? Just not familiar with a dual stamped bat. This bat is NOT a dual stamp bat. 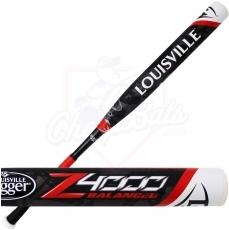 There were two other Z4000 bats (a dual stamp balanced and a dual stamp end load) but are no longer in production. The remaining Z4000's (SBZ416U-e and SBZ416U-B) will NOT be ASA certified. Do u ship to Canada? Is this bat new in the wrapper for $149.99? The description says one year warranty and then says out of wrapper discounted bats do NOT come with warranty in parentheses? We no longer have any out of wrapper bats in stock. These bats are new unused in the wrapper with a one year manufacturer's warranty. 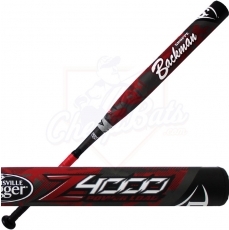 Currently this bat is on sale for $149.99. Is this bat in wrapper or sold out of wrapper? These bats are new unused in the wrapper unless otherwise specified in the available options. Is this bat single walled or multi walled like the 2014? The Z4000 is not a single wall bat, it's a composite layered bat. Out of wrapper bats are bats that are new unused but removed from wrapping for showcasing at our store front or used for images for our website. Out of wrapper bats are new unused but do not come with a warranty. Since it is out of the wrapper does it still have the full warranty on it? Out of the Wrapper bats do NOT come with a manufacturer's warranty. When the bat is out of the wrapper, does it mean that it is used? No, Out of Wrapper means it was taken out of its plastic wrapper and most likely used for photos, but it has never been used for hitting and is brand new.